Class-wise LEP 3Rs Progress on pre and post test Proforma, LEP 3Rs Programme Strengths,Suggestions on LEP 3Rs Programmes, State Level teams Monitoring the 3Rs LEP Programme implementation: LEP 3Rs Programme Monitoring Guidelines, Observation Formats: The targeted competencies have been prepared for State and District Level officers visiting the schools to observe to what extent the targeted competencies have been achieved. State Level Teams shall be drafted to all the districts for every 15 days to observe the implementation of LEP in schools and district level monitoring process and assess the progress and report to the C&DSE. The team also discuss the observations with DEO. MEO and other supervisory staff. The MEOs and School Complex HMs shall visit the School and observe the implementation of LEP/3Rs and record the observations in the observation format. 1. LEP 3Rs మొదలైంది. అన్ని జిల్లాల DEO లకు మౌఖిక ఆదేశాలు జారీ. కొన్ని DEO లు కూడా అన్ని రకాల పాఠశాల ల ఉపాధ్యాయులకు రాత పూర్వకంగా ఆదేశాలు జారీ చేశారు. 2. LEP మాడ్యుల్ ను అనుసరించి ప్రాథమిక పాఠశాల ల కొరకు ప్రత్యేకంగా మూడవ తరగతి నుండి ఐదు వ తరగతి వరకు మరియు ఆరవ తరగతి నుండి తొమ్మిదవ తరగతి వరకు తెలుగు మీడియం మరియు ఇంగ్లిష్ మీడియం లలో అన్ని సబ్జెక్ట్ ల బేస్ లైన్ టెస్ట్ పేపర్ లు బొమ్మలతో అందంగా తయారు చేయబడినది. 3. ప్రశ్న పత్రాల ను మనం బోర్డ్ మీద రాస్తే వాటిని చూసి రాసుకోవడం ప్రాథమిక పాఠశాల విద్యార్థుల కు ఎంతో కష్టం. అందుకని, ఈ ప్రశ్న పత్రాలు అన్ని ఒకే పేపర్ లో జిరాక్సు తీసుకునే విధంగా మరియు తక్కువ ఖర్చు అయ్యే విధంగా డిసైన్ చేయబడింది. విద్యార్థులు ఇదే ప్రశ్న పత్రాలలో నే జవాబులు రాయవచ్చు. వీటిని ప్రతి నెలకు రెండు సార్లు అనగా పదిహేను రోజుల ఒకసారి నిర్వహించాలి. 6. ప్రతి సారి నోట్ బుక్ లో lines కొట్టి రాయడం పెద్ద పని భారమే.. ఈ భారం తగ్గిస్తూ మీ కోసం మాడ్యు ల్ ప్రకారం అన్ని సబ్జెక్ట్ లు ఒకే పేజీ లో వచ్చే విధంగా రిజిష్టర్ తయారు చేశారు. ఒక్కసారి పిల్లల పేర్లు రాసి xerox తీసుకుని స్పైరల్ బిండింగ్ చేసుకుంటే ఖర్చు తక్కువ, పని తక్కువ, మరియు అందంగా ఉంటుంది. DEO WGL(U) Rc. No. 4497 /A7 /SSA/2017 Date: 22.11.2017 :: All the Mandal Educational Officers and Headmasters are here by informed that, a 60 Days LEP Programme (Learning Enhancement Programme) was started on 01.08.2017 in all the schools in the district to achieve the basic competencies in Reading, Writing and Arithmetic to all Children from Class 3 to Class 9. By 20th of November, 2017 approximately 75 days period of working days was completed. Accordingly, all the headmasters in the district are hereby directed to conduct the Post Test at School level and furnish the data in the prescribed proforma immediately. It is to inform you that, Post Test question papers for all classes and subjects shall be prepared based on the proposed class wise and subject wise competencies at school level by the concerned teachers only. There will be no supply of post test papers to the schools. The Mandal Educational Officers are hereby requested to constitute Mandal level teams comprising One School Complex Headmaster and one Resource Person to observe the nature of implementation of LEP programme, strategies being followed and progress achieving over baseline. All schools must be visited by the Mandal Teams. District level teams also monitor the programme. Further, the Mandal Educational Officers are hereby requested to collect the data of Post Test in the prescribed format from all the schools and furnish the data in the prescribed mandal level proforma and submit to DPO by 30.11.2017. C and DSE Telangana :: Proc. Rc. No. 471/RMSA/TS/2017. Dated :20.11.2017. Sub: RMSA, Telangana, Hyderabad - Implementation of Learning Enhancement programme (3Rs) for (60) days from August 2017 onwards - Monitoring the implementation - Reg. &Ex-Officio Project Director, RMSA & Model Schools, Telangana, Hyderabad at Para no.142, n.f. at page no.58 c.f. All the District Educational Officers and Ex-officio Project Officers of SSA and RMSA in the state are informed that the LEP programme is being implemented in the State for (60) days from August 2017 onwards. In this regard instructions of have already been issued to all the District Educational Officers to constitute Manda!& District Level teams and conduct monitoring of implementation of LEP vide reference first read above. > The programme has been started in the schools with conduct of baseline Test. > 95% teachers have attended training on LEP & its implementation aspects except Residential Schools & Schools under Tribal welfare Department. > The Module on LEP has been reached to all the schools. > Baseline test was conducted in most of the schools. > Time-table was prepared in most of the schools and the programme is being implemented. > It was observed the modules have been reached late to some of the schools and both parties i.e., H.M and DEOs (Sectoral Officers) not shown interests. > Reading of library books / children literature is being encouraged in about 90% of schools. > Traditional methods of dictation, writing words on the blackboard is seen in majority of. the schools rather th-an following strategies given in the teacher handbook. > There is no proper coordination between H.Ms, MEOs, School Complex H.Ms and Sectoral Officers in the implementation of LEP / 3Rs programme. > All the HMs, teachers, sectoral officers, school complex H.Ms and DEO must possess knowledge and awareness on the 3Rs strategies so that they can monitor and observe the programme in schools and provide possible guidance and support to the teachers. > The DEOs must constitute Manda! and District Level Teams i.e., Mandal level teams at school complex level i.e., one school complex H.M and One R.P and District Level Teams with Nodal officer, sectoral officers and R.Ps to observe the nature of implementation of LEP (3Rs) and strategies being followed, progress achieving over baseline, reasons for not achieving the progress. > Special focus in need in Model schools and KGBVs. > All schools must be visited by the Manda! Teams and observe the procedures followed and the progress is to be monitored. > The progress of LEP must reviewed school-wise during school complex meeting by the School Complex H.M.
> Teacher-wise review based on progress of the group for which the teacher is incharge. The teachers who achieves 100% targets must be appreciated. > The District shall present their observations to the MEOs. The State team members shall visit the Districts during the District team visits. > The Commissioner & Director of School Education & Ex-Officio Project Director, RMSA/Model Schools, TS, Hyderabad shall review the implementation and progress on LEP on 8th December, 2017. Every District Educational Officer shall prepare a report on the given Template. > After the Post test** the exact number of students unable to perform 3Rs shall be finalized and LEP shall be continued till 31st December, 2017 so as to achieve 100% target. Every school will be reviewed for its performance by the district and as well as state teams. Every Head Master shall prepare school report for the reasons not achieving 100% 3Rs and shall be certified by School Complex H.M, MEO followed by DEO. Such schools will be visited by the state teams during February to assess the reasons and suggest improvement strategies. Therefore, the District Educational Officers and Ex-officio Project Officers of SSA in the state are directed to send district level reports on or before 61h December, 2017. The School, Mandal and District Proforma to report data on children progress i.e., pre and post test is enclosed. C and DSE and Ex-Officio PD, RMSA, Rc.No.471, Dt.04.09.2017 :: Sub: RMSA Telangana Implementation of Learning enhancement programme (3RS) in all Primary, Upper Primary and High Schools - Drafting State level teams to observe the implementation from 7th to 12th September 2017 - Orders issued. Ref: Proceedings of C&DSE Rc.No.471/RMSA/TS/2017, dated:26.07.2017 and 01.08.2017. All the DEOs in the State are hereby informed that, vide ref. cited detailed guidelines have been issued for the implementation of LEP (3RS) programme in all the schools from 01.08.2017. Duly conducting a baseline study to identify children who cannot posses basic skills of reading, writing and arithmetic. The teacher hand book on in the implementation of LEP and learning outcomes have been printed provided to DEOs to in turn provide to the schools @3 copies per school along with work books developed by SCERT in collaboration with save the children. The DEOs have been directed to depute District teams to observe the implementation of LEP in schools during August before the visit of state teams and make ready the reports of district teams on the implementation of LEP and reaching of targets fixed for every 10 days. Now the State teams are drafted to all the Districts to observe the implementation from 7th to 12th September 2017 the names of the team members drafted to districts and dates of visits is enclosed. A team of 6 State Resource Persons shall visit each district and visit the schools and discuss the observations with DEO and MEO, School complex HMs on the same day after completion of school visits. MEO from each Manda! and one School complex HM from each Manda!, Sectoral officers, Nodal officers shall attend the meeting at District level with DEOs. The DEOs are directed to select 6 DRPs @2 per subject i.e. Telugu, English and Mathematics and accompany the 6 SRGs to visit the schools. The sectoral officers shall coordinate the programme with SRGs on the date of visit. The DEOs are directed to provide accommodation to the SRG members on the day of the visit along with boarding duly meeting expenditure from available RMSA/ SSA budget with the DEOs. The Learning Enhancement Programme being implemented in schools and prepare the student for undertaking National Achievement Survey to be conducted during November 2017. Therefore, the focus is to achieve the foundational skills and as well as subject specific in all the subject areas. The DEOs are directed to relieve the SRGs as per the list enclosed for the visit of the schools and their absence may be treated as on duty. The TA, DA and honorarium may be provided to the team members from State RMSA /SSA budget. The State team members shall attend planning meeting on 06.09.2017 and review meeting after visit on 13:09.2017 at the OUCIP at 09.30 AM with the reports. Encl: List of SR Gs and visit schedule to the Districts. One Sectoral Officer each for primary schools and Secondary School shall be designated for monitoring, reviewing and sending the instructions to the schools and as well as the reporting the progress. Wherever Sectoral Officers are not available nodal officers may be given incharge for monitoring and reviewing. In case where sectoal officers and nodal officer are not positioned the DEO is directed to keep to Headmasters of High Schools as incharges of LEP Programme for primary and secondary till the positions are sectoral officers are flied. 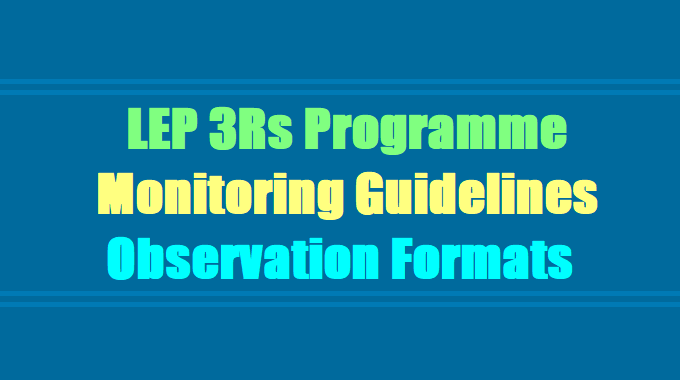 The DEOs shall visit schools of all types and observe the implementation of LEP/3Rs i.e., 3 to 4 school per week and send the filled in observation formats to the Director, RMSA. They can monitor the LEP programme and guide the teachers in the field. The School Complex HMs shall visit the schools under their purview and review the LEP Progress during the School Complex Meetings for primary and as well as for high schools. The Mandal level RPs who trained the teachers at Complex level on LEP shall attend School Complex level meetings and participate in the LEP Progress Review and clarify the doubts.